Lunt Solar Systems does everything possible to match the quality of each optical component in our systems for maximum performance. 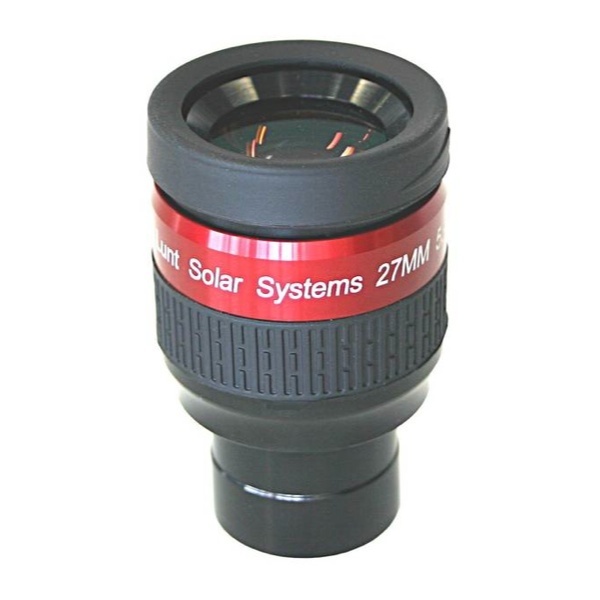 This eyepiece with 27mm focal length is coated with the same anti-reflective coatings as on the etalons. The anti-reflective coatings reduce ghosting and glow and aid in providing darker background. The 27mm eyepiece provide a 53 degrees field of view, and 18mm eye relief. It has a very nice height adjustable eyeguard to protect your eye against day light reflections and to help you to find the perfect eye position. Given the optimization in the red end of the spectrum, LUNT eyepieces will also work very well for night time observing.